We spent a couple days this week vacationing with puj owners and designers Ben and Katie and their three adorable boys. When we arrived Katie whipped out one of these KidCo tents and I instantly knew I was in serious need of one. 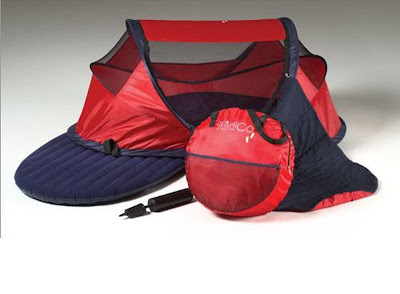 They fold up into a tiny circle that you can take almost anywhere, and they unfold into the perfect kid-size tent in a snap. They are perfect for the beach, camping, traveling, naps, forts.. the possibilities are endless and really every mother needs one. These were on sale at Overstock a while back, maybe they still are. thanks for the tip ashley. i'll look into it. do you have one? do you like it? I have one of these and LOVE it! We took it to the beach for our 9 mo. old last year and it was great! Lots of room, comfortable and the only way she got sand in it was from her feet when we put her in. She kept cool because of the breeze through the top. A must for camping or the beach. We also have the PeaPod in both sizes ... the smaller size was nice but my son grew out of it really quickly. The bigger size I LOVE and my 3 year old still uses it. We've taken it to the beach, parks, camping ... it was so nice to have a relatively clean place to have the baby before he was mobile. I'd skip the smaller size and just go straight for the bigger one, though - more for your money! I love to follow your blog. And i had to laugh when I saw this post--Ben and Katie are my cousins. Small world. Glad you had fun with them. we got one for christmas and we've used it so much ever since - trip to europe, moving cross-country, and now on camping trips. my husband was skeptical about it when we got it, but now he admits that it's been one of the most useful baby items we've ever gotten.